It’s a random post today. Random picture post, that is. On Sunday we drove to Plymouth and saw brant and seagulls. 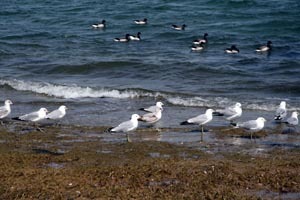 And seagulls and brant. There were a lot. 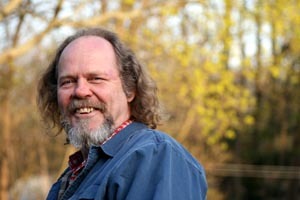 I love the combination of my husband and a telephoto lens. Don’t you laugh at this one! I bought Mason a harness so that he can be outside with us. The success of this venture remains to be seen. You just never know what to expect when brother-in-law Randy shows up with the backhoe. 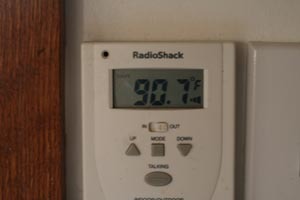 The thermometer in our kitchen yesterday. It sure felt like summer. We celebrated by having lobster rolls. 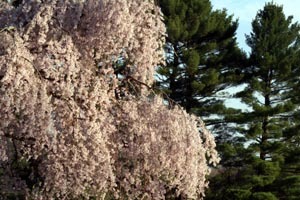 A flowering tree at Borderland State Park. So pretty! Mason doesn’t look too happy, but maybe he’ll get used to it and being outdoors. Love the tree! mason doesn’t look happy. we took Pumpkin out on the deck yesterday and well, she ran right back in the house. (secret fear of squirrels). back hoe, huh? Whatcha diggin’? Wow, 90 degrees yesterday! You’ve skipped spring and gone directly to summer. We had some nice sun yesterday but then the storms returned. Sog, sog, soggy! Yeah – I’m thinking Mason din’t like the experiment! I’m really trying NOT to laugh, but what I really want to know? How on EARTH did you get the harness ON Mason???? The Meezer would have informed the entire neighborhood that she was being ABUSED!!! (at the top of her lungs) and then become 11 pounds of STIFF. Upon which she’d have bolted under the bed. I think you’re supposed to start using those things while they’re still kittens…we had a wonderful, elderly tuxedo kitty at the vet who took a twice daily “constitutional” in his bright red harness…and LOVED IT! Phantastic Photos!! Dale’s not laughing at Mason is he? I’ve put a harness on Ace a couple times and lived to tell about it! My house was pretty warm too, but not quite that warm. Yuck. It is a very random day isn’t it? Love the pictures. Just think… on more week! Your hubby looks soooo happy in the photo! Great pic! 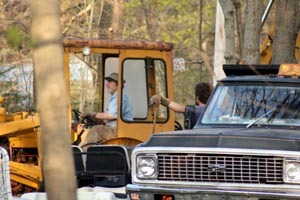 Was he laughing at the look on your face when you saw BIL arrive with the backhoe??? Can’t believe it is 90 there… here in ‘bama it has been in the low 80’s! Dale looks so much better! Has he fully recovered? 90 in the kitchen? Oh mama. No. Hello Air Conditioning! my car said it was 86 degrees yesterday. happily it was only 72 in the house. and, that is one fancy backhoe. our backhoe doesn’t have a covered cab. will you please let me know how mason does with the harness? i would love for my cat to be able o go outside! I love the harness. We trained a cat on a leash in West Philadelphia, and I walked her around the block a few times. I had to pick her up when dogs appeared. The harness looks much more comfortable. She liked it best in the backyard when we gardened. Now our kitty goes outside by himself; recently staying out all night. Makes me a little nervous. We are lucky to live near borderland. enjoy. Good luck with Mason and the harness. 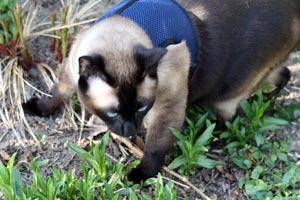 I once had a Siamese, and was able to leash train him. He had a slight vision problem, and stairs posed a problem. But, once outside, he LOVED it. I love Mason’s harness. We have a fine cat who has an illness that won’t let him get shots so we have to harness him and take him for walks. Where did you get that jacket-like harness? And it sure looks like spring in the Northeast to me! I bought one of those for Pumpkin and he practically turned himself inside out trying to get it off! Don’t let Mason see pix of my cats outdoors. He’ll get jealous. Would you please send the specs on where I can get a harness like that? My big guy, Max, has been trained to walk on a leash & now I’d like to train the young boy, Beau, but it’s hard to find the proper type of harness. Those ‘s’ types are no good, & yours looks intriguing. BTW, try ‘clickertraining.com’ for some help in getting your cat used to a harness & leash and for the best info ever on how to train (read: communicate) with your furry buddy. This lady helped to develop the training method used on dolphins & she really knows her stuff. I’ve used it very successfully with my own cats & love it. I’m so happy I ordered the book/kit. It’s changed our lives together. Yum, lobster rolls. You are making me jealous. But I will have a crab cake for you instead.